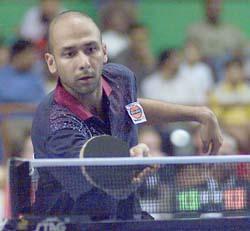 Chetan Baboor is an International table tennis player from India. Chetan Baboor was born in the year 1974 April 22. He was born at Lucknow, India. Chetan Baboor is the arjuna award winner in the year 1997. He was one of the best players from India who had won many medals and achievements. at the age of 16 itself Chetan Baboor became the member of National table tennis team. Chetan Baboor represented India in 1992 Barcelona olympics, atlanta Olympics in 1996 and 2000 Sydney Olympics. Chetan Baboor has won four national titles in men's singles tournament. He also won two gold medals in commonwealth games in doubles. His major achievement is that he had beaten Liu Guoliang who was the Olympic gold medalist. Chetan Baboor had completed his MBA from Thunderbird University and Mechanical Engineering degree from Rashtreeya Vidyalaya College of Engineering. More details about the profile and achievements of Chetan Baboor are given below. * Two gold medals in commonwealth games in Doubles table tennis category. * Represented India in 1992 Barcelona, 1996 Atlanta Olympics and 2000 Sydney Olympics. It is a coincidence that my son AKHIL.V is also a table tennis player who represented his state at the national level ,and individual events at the country level, but unfortunately was not as successful as Che tan Ba boor.Che tan is one of the greatest players India has produced.We hail from Bangalore and were fortunate to meet him at his home before he left abroad.He gave us some wonderful tips and we thank him for that.Table tennis is such a game that requires agility ,speed ,intelligence,endurance ,&strength ,it has some how become acceptable that we cannot perform well at the international level for whatever reasons there may be.For Che tan and handful of players who have done well is no mean achievement .Kudos to him and to the writer who has brought forth this article.Such articles does encourage players of games other than cricket to do well . This is Interesting information about your son. One day Akhil will also won medals and achievements for our country. I am excited about this information as your son played national level. Say my regards to him. Best of luck for Akhil for his future tournaments. I am also a good badminton player but not a professional player like your son.